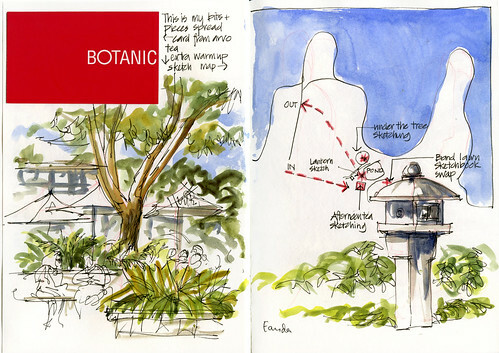 Well today was the first of six Garden Sketchabout at the Royal Botanic Garden Sydney as part of the Sydney Morning Herald Autumn of the Arts festival...and can I just say up front that it was WONDERFUL!!!!! 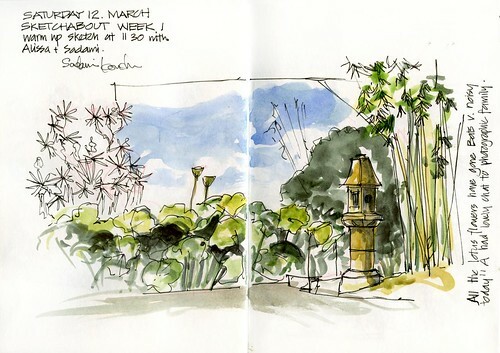 Alissa and I got to the gardens before 11.30 and shortly after arriving we found a sketcher already in action! She joined us in a 'warmup' sketch at the lotus pond. After an initial welcome the sketchers scattered all over the garden. I was doing too much talking (so out of character?!? NOT!) 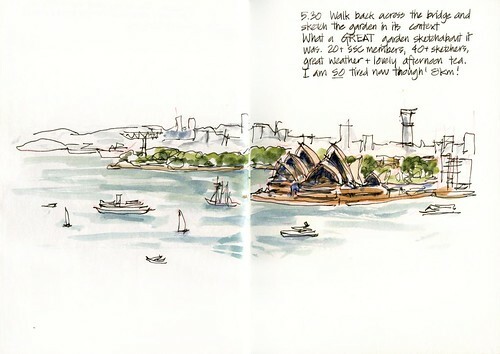 and found it hard to concentrate on sketching. It is occasions like these that training your hand to 'reflex sketch' comes in handy. 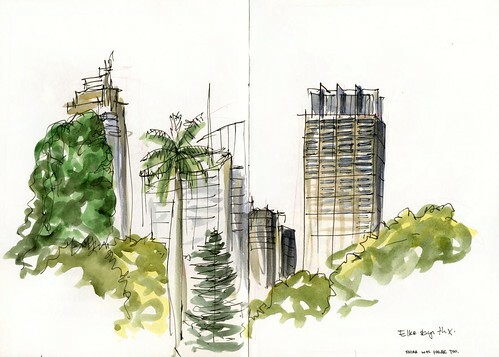 Another sketch from the same spot - funny I am always drawn to the built structures visible in the garden! 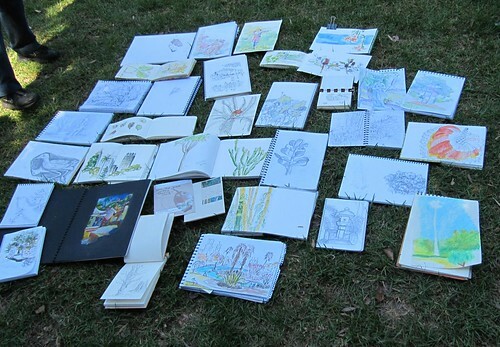 We then had a wonderful session at the band lawn - meeting more sketchers, swapping sketchbooks and a group photo. 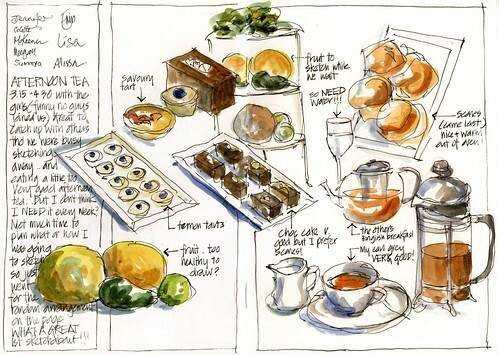 9 of us from the Sydney Sketch Club finished the afternoon with a special Sketchabout afternoon tea at the Restaurant. Do I need to say that we had a great time in many ways! 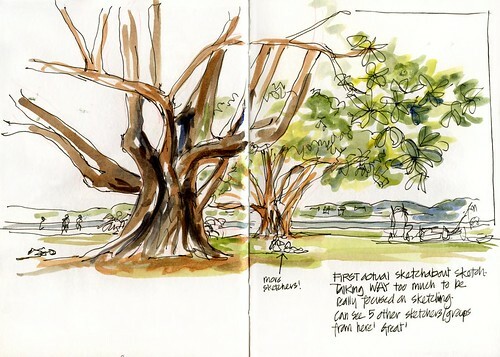 Finally, for me, I walked back across the Harbour Bridge and sketched the gardens in context. 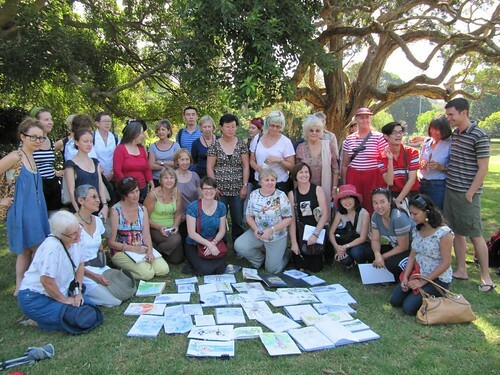 this shows how important the garden is to the city of Sydney! What a wonderful wonderful day - I am one hyped up but somewhat exhausted little sketcher now! And we do it all again next Saturday!